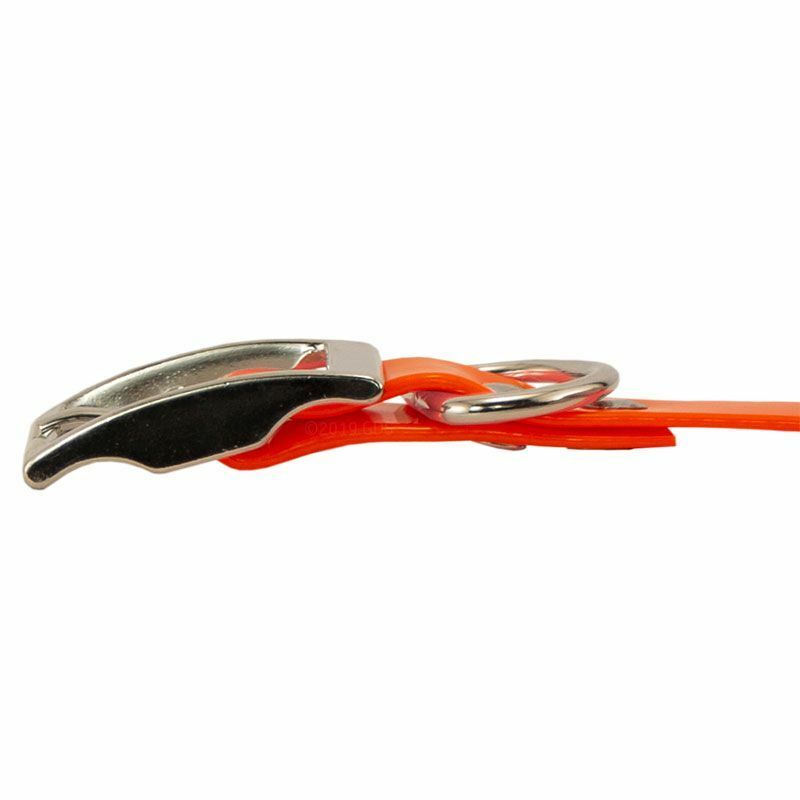 ORANGE 3/4 in. 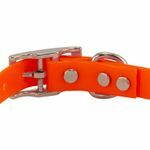 Day Glow Standard Collar. $4.99. "These collars are of exceptional quality." I'm taking this quick opportunity to tell you about the dog collars I ordered last year. They are mesh covered in heavy plastic with a brass name tag. They are heavy and I was afraid that they would be too heavy for my yorkies, but they have worked out wonderfully. The pups can't chew on each other's collar and I feel relatively safer now that they have their names on their collars. 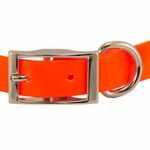 These collars are of exceptional quality. I don't need a fence right now, but I will shop with you again. Thank you so much! Best bang for the buck and my daughter loves the pink one. Lab and Scottie. Family pet. Love, love, love it! I have a Scottie that loves to swim in our pond, but the usual nylon collars get very stinky when wet. These are perfect and the bright colors are so pretty against his black coat. Fast and excellent service. Have already recommended to several friends! 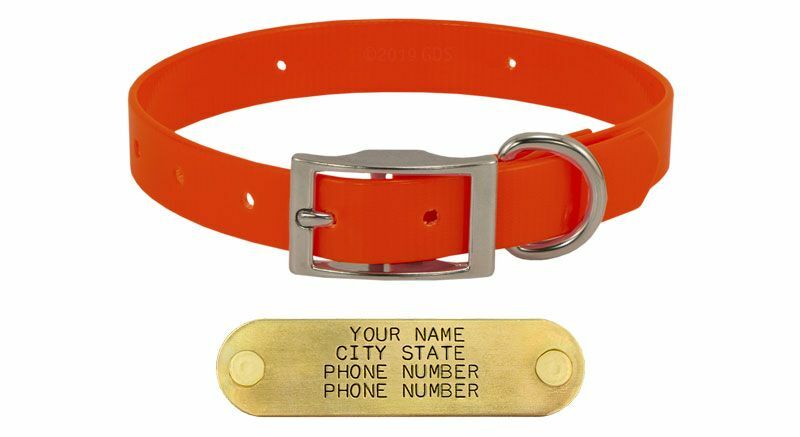 "I'm glad to have all of his identifying info right there on the collar." Border Collie Mix. Family pet. At 8 weeks it fit him and he's getting used to it -- I'm glad to have all of his identifying info right there on the collar. It was so convenient and well-priced, my roommate ordered one for her young Golden! 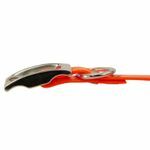 "It fits well, got here super fast, and the customer service is great! " I got my dog the purple collar, and in the photo it doesn't look so vibrant. I was hoping it was a little more bright, and turns out it is! I love the color. It fits well, got here super fast, and the customer service is great! And the price is hard to beat. Love it. "Really sturdy, festive and bright!" Really sturdy, festive and bright! 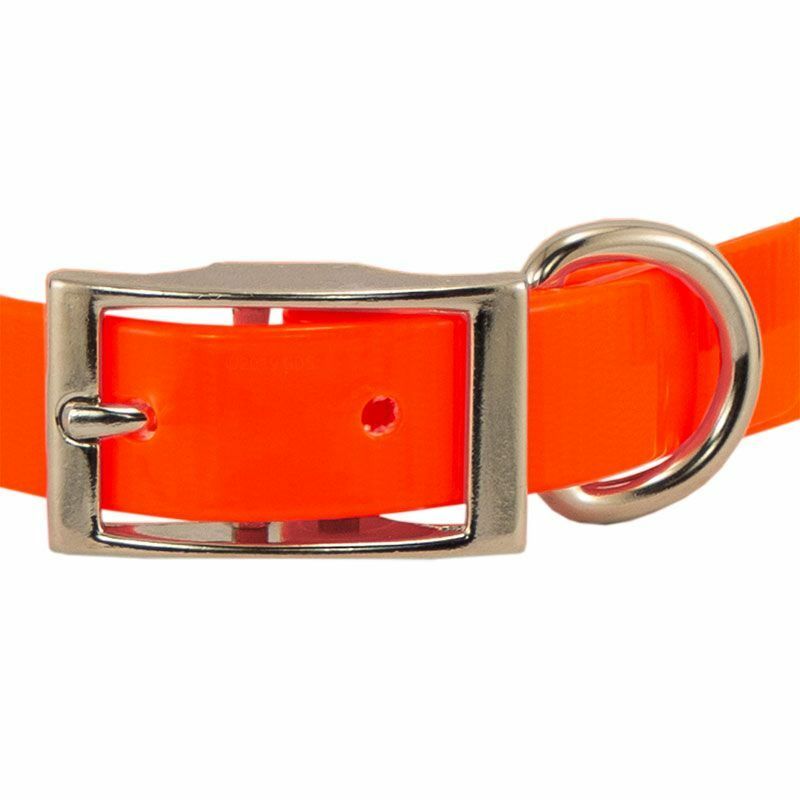 we got one in blue and it looks great and has nice contrast with our Vizsla's red coat! We love the brass name plate-- great feature! "Good quality, and a great price!" Good quality, and a great price! I love these collars. The engraving is the best I've ever seen. My boyfriend loves these for his hunting hounds. They are even perfect for our inside pets. 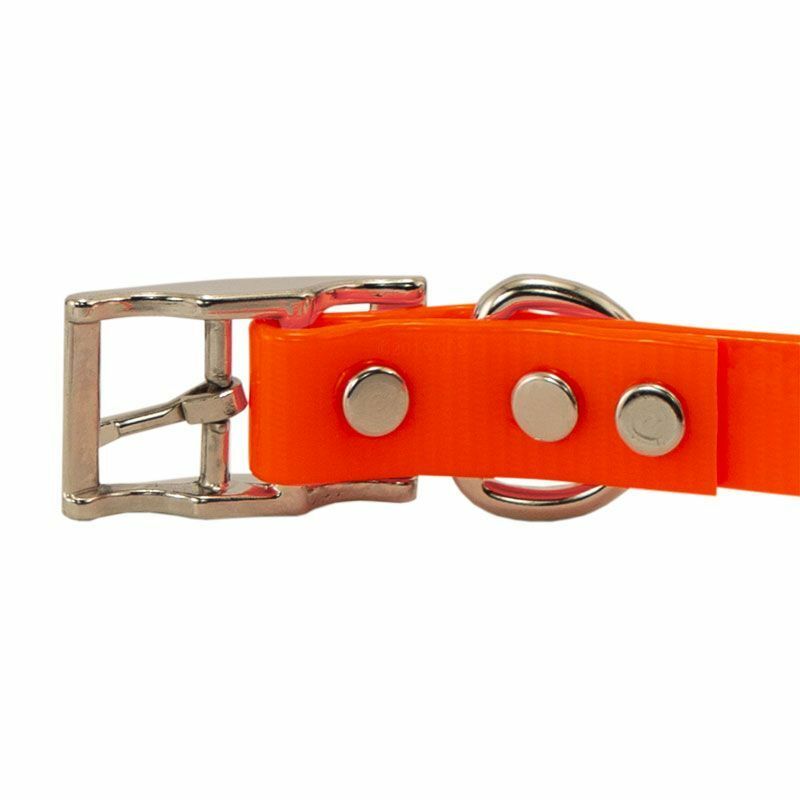 They are made with great material, and the size was perfect for our inside pets. Great product. Color is vibrant and very eye catching. 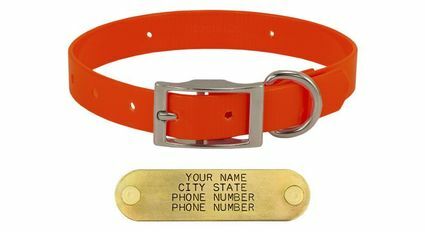 Bought these for my agility dogs because their regular tags kept getting lost in the yard. These were a much better solution to replacing hanging tags constantly. I love these collars. 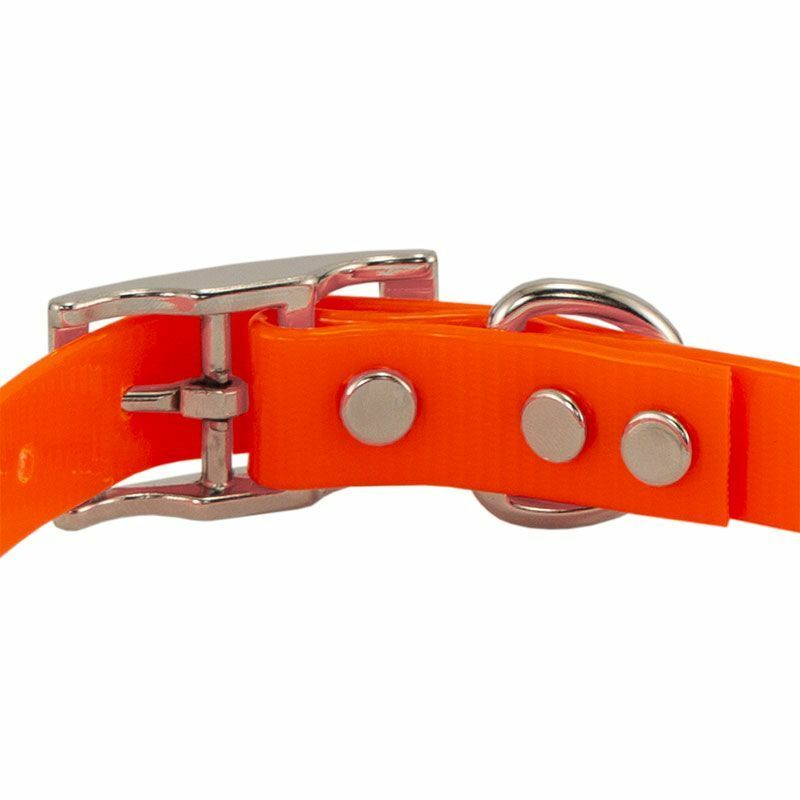 I honestly won't buy the collars with the ring made into the collar, I have had several of them break where the rivets pull through. "Fits nicely on my large and small dogs." Fits nicely on my large and small dogs.